Dr Hue-Tsi (Tony) Wu, senior pathologist/lecturer in the Division of Anatomical Pathology, was successful in the recent Histopathology examination of the Royal College of Pathologists, London, United Kingdom. He will be admitted to the Fellowship of the Royal College of Pathologists (FRCPath) in January 2016. 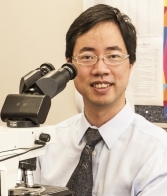 Dr Wu joined the Division of Anatomical Pathology as a registrar in May 2005. He was successful in the Fellowship examination of the College of Pathologists, Colleges of Medicine of South Africa in May 2009 and was awarded the Coulter medal for the Best Fellowship candidate in the Pathology disciplines. A year later he completed his MMed dissertation with distinction. Dr Wu has a special interest in gynaecological cancer and is a member of the SAMRC/UCT Gynaecological Cancer Research Centre.